I’m using the word by incorporating all three definitions of the word moxie. I’m also choosing to focus on the order used by the Merriam-Webster Dictionary definitions, but first — a back story for today’s show. There have been times in your life when you were excited and thrilled at the prospect of doing something. Maybe it was something brand new, something you’d never done before. Maybe it was a job, or a new responsibility at work. You weren’t completely sure of yourself, but the thought of it gave you energy. Think back to your childhood and Saturday’s spent playing. Whether it was a backyard, a ball field or anywhere else you gathered with friends — the act of playing accomplished the first definition. It gave you energy. Well, to be more exact, it gave you energy if it was something you really wanted to do. Sometimes my friends and I would sit around and toss out ideas of what to do next. Somebody might suggest something that wouldn’t fuel my energy. Like baseball. I was never fond of it, even as a little kid. I’d go along if it appeared everybody else was into it, but if I could negotiate to do something else, I would. Football. Basketball. A game of HORSE. Building a fort. Going into the woods to play hide and seek. All of those were far more energizing to me. You had things that energized you. Think about what they were. Something magical happened when we played. Our imaginations soared. We thought about being bigger than we were. This week the Cleveland Cavaliers held their NBA Championship parade. It’s been decades since the city of Cleveland had a championship. Ask any of those players about this moment in their lives and they’ll all tell you about memories they had as kids playing basketball. They imagined making the game winning basket. They imagined being winners. Champions even. Those dreams first emerged when they were little boys. It was our first experience with moxie. Our moxie wasn’t identical to the moxie of our buddies. I had a buddy who enjoyed boxing. So did I. We boxed a lot. Other buddies didn’t like it. They weren’t energized at the thought of boxing. I was. My buddy was. At first, he was the only one with any experience. And he owned the boxing gloves. He was a bit of a fighter at school, sometimes. I had never fought. I’ve never been in a fistfight. Ever. Still. My buddy whipped me pretty good at first because I didn’t have that 3rd trait of moxie – know-how. I didn’t care. The activity was cool. And fun. I was engaged. Doing it was exciting and energizing. As a result I didn’t have to work up any courage or determination to do it. I wanted to do it. I don’t imagine anything could have stopped me from wanting to do it. If getting hit in the face repeatedly doesn’t deter you then I guess you know you’re onto something that fuels your moxie. I’d frequently ask my buddy, “Let’s box.” I’m sure he even got sick of it, but I wanted to do it more and more. And over time I learned. I figured out how to avoid getting hit in the face. I embraced in myself all the things necessary to be effective. I wasn’t afraid of being hit in the face. I wasn’t afraid of hitting my buddy in the face either. We were friends and it never got out of hand. It was sport and thankfully we both – even as grade school and junior high school kids – kept that perspective. If one of us was getting the best of the other, we’d stop. And find something else to do. Sometimes know-how happens quickly. Sometimes it never happens. You never know until you try. A maverick is a person who refuses to follow the customs or rules of a group, but I don’t think of them as a rebel. Others may. Rather, they’re people with higher self-awareness. And they’re people who are mostly unwilling to try to be somebody they’re not. Mavericks aren’t people who refuse to become the best version of themselves. No, that’s exactly what they are trying to do. Others look at them and think they’re non-conformists, but that’s not right. The maverick is trying to conform to his own ideal. Mavericks believe in soaring with their strengths. They’re not overly concerned with what they can’t do, or what they don’t want to do. Others are concerned about that, and constantly try to impose on them their own ideals. Mavericks push back. Sometimes they have to push back with substantial force or people won’t back off. Like my left jab against my boxing buddy – I had to use it to keep him at bay. If I didn’t, he’d keep moving forward with aggression. I couldn’t let him do that, unless of course I wanted to eventually get hit in the nose. 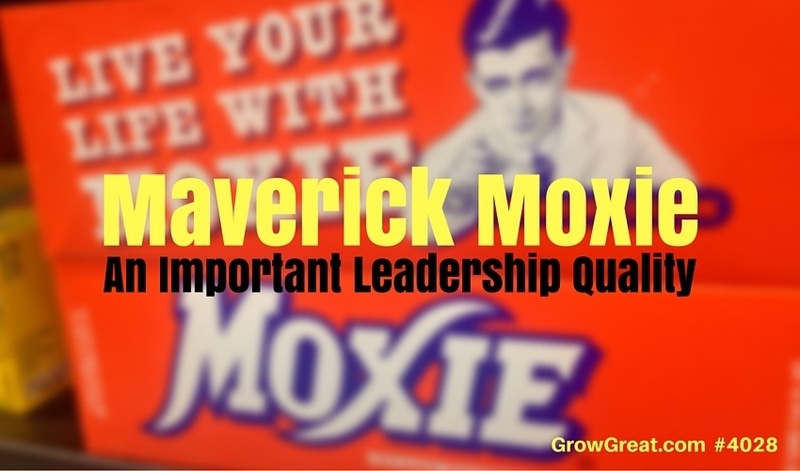 You’ve incorporated maverick moxie in your life before. Like me, you likely started doing it when you were a kid playing with your friends. There were times you held your ground because you simply didn’t want to give in. It wasn’t all the time. I didn’t want to box all the time. I never would have chosen baseball as the thing to do, but I’ve played in plenty of sandlot baseball games because I cared enough about my friends who did want to play it. My maverick moxie couldn’t rule the world. That’s not moxie at all. That’s just pure selfishness. But when it comes to leadership – when it comes to us doing what we want to do, what we need to do – it is up to us. Leadership starts with our lives. First, we’re the leaders of our own lives. I have no idea which positive thinking guru first came up with that, but there are parts of it I love. Self-accountability mostly. It certainly starts with us, but there’s quite a lot more to it. I knew if I wanted to box, then I had to take charge and suggest it. Well, not always, but often. I couldn’t box alone. I needed my buddy’s willingness. So it wasn’t entirely up to me even though maybe I initiated it more often. Your life is your life. It’s a mistake to let somebody else try to direct or drive your moxie. Mostly because it’s not their role or ability. How would my life be if I let a buddy with baseball moxie determine my own moxie? Miserable! That’s how it would have been. I didn’t like baseball. Could I have learned to love it? Maybe, but not likely. Would I play it sometimes and enjoy it? Yes, sure. But faced with other options, I could easily list at least 10 other things I’d rather do. Baseball just didn’t hit the first mark of moxie – energy. Your energy is personal to you. Let somebody direct your energy and you’ve already lost. You know that because it’s happened to you before. It happened when you were a kid. It’s happened to you as an adult. People have attempted to hammer you into a space that just isn’t shaped like you are. Square pegs into round holes and all that. Like Popeye, “I am what I am.” Again, you can and should work to become a better version of yourself. And yes, you should improve things that need improvement. As you look at your strengths and your inner leanings where your capacity is high (and your natural aptitude is also high), you should ignore what others think and say. Think back over your career – no matter how short or long it may be. People (probably quite a few people) have tried to get you to do things you knew weren’t right for you. Things that hit that first moxie trait – they gave you energy – but people ruined it for you. Your courage and determination got tested and you decided it simply was no longer worth it. I had that experience in high school football. I started playing football in 5th grade. That was when kids could first play football (I’m old and that’s how things rolled back then). It was full pads, tackle football. By the time I got to high school I had played football for a few years. I enjoyed football. It was physical. I enjoyed hitting, mostly tackling. It enjoyed being with my buddies. I liked everything about it. Weeks before school started, in high school, we gathered on the football field in the summer heat to participate in try outs. No gear. Just workout clothes and sneakers. It was a brand new high school. The defensive coach was fond of me. I worked hard. I hustled. I was quick to the ball and had good vision. The head coach was a jerk (why is that often the case?). Here we are a bunch of guys who have played ball together since 5th grade and this guy is talking to us about a 3-point stance (how guys get down prior to the snap of the ball). It started going south for me rather quickly when the coach said, “Whichever way you take a guy’s head, that’s the way he’ll go.” DUH. The snarkiness in my brain couldn’t be contained. I chuckled. “You think that’s funny, Cantrell,” said the coach. “Yes sir, kinda,” I said. Unable to leave well enough alone I pointed out how we weren’t allowed to hold. The next thing I remember is doing duck walks for 400 yards. It wasn’t a fun punishment. Then again, I don’t suppose punishment is supposed to be fun. I loved football, but this guy was now going to be in charge of my football life so I quit. I walked away, happily. It had nothing to do with energy for the game, or know how. I no longer had the courage or determination to endure his idiocy. Has that ever happened to you? Was it moxie to quit? I think so. I had to take control of my own life and my own choices. Giving up football mattered more than submitting to a moron head coach. I never regretted it. I’m sure he didn’t either, even though the defensive coach tried to get me to reconsider. Saying yes would have meant surrendering energy and so the moxie would have died anyway. It had nothing to do with football. It had everything to do with people involved. If you’ve listened to me at all you knew it might come around to this. It almost always does. Mostly because few of us can operate in a vacuum all by ourself. I needed my buddy to box with me. I needed a coach I was willing to play football for. My love of boxing and football only carried me so far. And if I hadn’t had any skill for either, well all bets would have been off. I wouldn’t have likely enjoyed either of them. Did love fuel skill or vice versa. I don’t know. It probably works both ways. I think it did for me. It’s about doing your best. It’s about being the best YOU. Your energy, courage and determination coupled with your know-how comprise your moxie. Remove maverick from the equation and where are you? Nowhere. You need maverick moxie. No other kind will do. Not if you’re going to be a real leader. A leader of your own life and a leader of others. You’ve got to have the courage to decide for yourself. And pay the price for it. The thing that pumps you up…the thing that excites you can be ruined by other people who enter your life (or are already there) and want to urge you to do something else. They have expectations and objectives in their own lives or careers. Everybody has a vested interest in things going a certain way. Rarely will you encounter people who want to serve you to help you with whatever YOU want. It can happen, but it’s not common. Far more common are people who will act as though they have your best interests at heart, but there’s something else going on. I know all that sounds terribly selfish. And it is. It’s also mostly true. Not always, but mostly. These are two of the most common phrases we hear from people who don’t agree with our choices. Maverick moxie means you ignore the voices except those who have proven they’re ready and willing to help you reach your potential. They’re out there. Hopefully you’ve already got a few people in your life like that. If not, start looking. Find them. They’ll help accelerate your growth and they’ll help you become more of who you want to be. That little kid version of you that dreamed big and imagined being wildly successful…it may be possible. How will you ever know if you don’t try? But surround yourself with people who are able to see what you see. We all need people who see that big dream in us, and are willing to help us achieve it. Yes, listen to the sound counsel of people you know who have your best interest at heart. Yes, kick to the curb quickly everybody else. Does this look the same for all of us? No. It’s individual to you. And me. And everybody else. Each of us has to decide what this will be in our life. In Nashville there are plenty of people who want to be music artists and stars. Some want to play country music. Others want to play rock, or alternative. Some want to write songs. Others want to perform. Nashville is like many other places filled with creative people chasing dreams. Why do these people pursue such dreams in such a competitive place and such a competitive industry? Because it hits that first definition of moxie. It gives them energy. That energy may not look the same for each of them, but they’re all energized by the pursuit. Like my love of boxing with my buddy, these people are highly engaged when they’re doing it – whatever IT is. Writing songs. Playing guitar. Performing. They love it. That love – the energy they get – drives their courage and determination to do what they need to do. They hold down full-time day jobs to make a living, then at night they go play some club for tips. They do it night after night while other people are enjoying friends, watching TV or relaxing. These people are sacrificing those things, but it doesn’t feel like a sacrifice to them. They’re doing what they want to do. They love doing it and that love elevates their energy every time they do it. What may cause dread or anxiety in us drives them to take the stage. Just like my first boxing bout, they’re not all great at it when they begin. They don’t care. Courage and determination propel them forward knowing they’re going to improve. They’ve got a big dream. They can see what the rest of us can’t. Success. It doesn’t matter that they won’t all get it. Not now. Right now, the only thing that matters is their willingness to try. It’s the only way they can find out. They simply have to make the attempt to see if their big dream has legs. So they embrace courage and determination to get up on stage night after night and get up in the morning to go to their day job. They pay prices most of us wouldn’t pay because this is their dream. Not ours. Over time they gain know-how. Even people with limited talent can gain a degree of know-how. A person can be a competent musician in Nashville and still not achieve success. Nashville, like any other big city, is filled with talented musicians we’ve never heard of. It’s got nothing to do with moxie. It’s got everything to do with serendipity, timing, uniqueness, popularity and a host of other things…many that are beyond our control. I know, I know. We want to think we’re in command of our lives. We are, to a point. It’s up to us to assume responsibility for what we can control and to not get too wrapped up about the things beyond our control. In short, we have to do our best to give ourselves the best opportunity. Maybe we’ll hit. Maybe we won’t. Still we try. Read interviews with music stars and you quickly see people who were determined to do things the way they most wanted to do them. It didn’t mean they refused to listen to wise counsel. They just leaned heavily toward being who they most wanted to be, doing things that felt most congruent and authentic to them. That’s the maverick part of the deal. Doing what works for YOU. That’s important because we’re all different. There’s absolutely something to finding our own way. Sure, it can help to see how others may have done it, but they way they did it may not feel right for us. And it may not work either. I don’t know about you, but I’d had to tell quite a few folks to step back along the way. My biggest successes have often come when I got my gut full of listening to other people trying impose on me, and rob me of my strengths. I’ve been told that my empathy is a problem, when deep down I know how remarkable it is – and what a gift it is. I’ve been told my ability to be present and to see people’s vulnerability is a weakness that I should manage. When I know how rare it is for any of us to experience others who are genuinely interested in us and able to see our pain. Again, I’m arrogant enough – self-aware enough – to know that empathy and being present (some call it emotional intelligence) are two of my super powers. I don’t have many so I have to be protective of the few I do have. Be a leader. Own it. Be who you are when you’re most alive. When the fire burns the hottest. When you can’t wait to get to it. The people in your life need to see it. Those you serve do, too. You need moxie. You may as well make it maverick moxie!